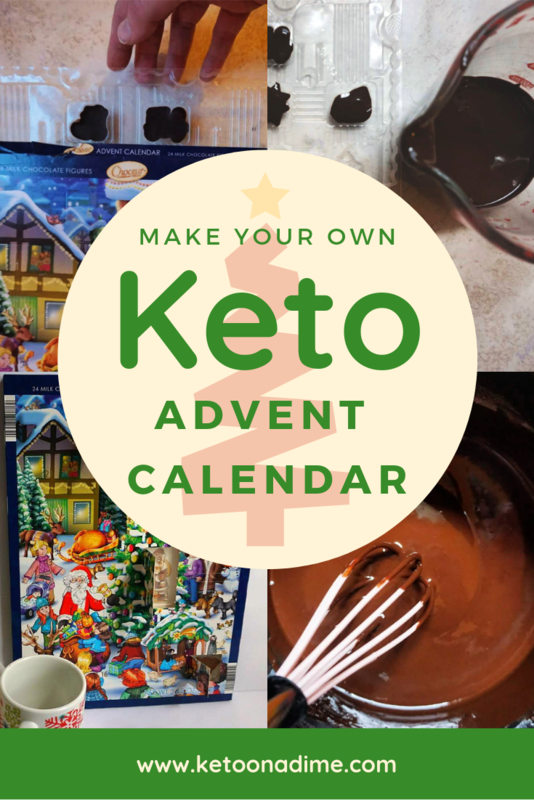 Today I’m going to show you how to make a Keto Advent Calendar! I grew up loving Christmas and that enthusiasm has stayed with me to this day! 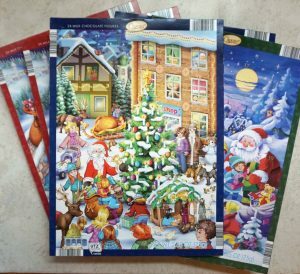 One of the things I loved to do during the Christmas season each year was the advent calendar. Growing up we had an advent calendar with pockets and a tiny little mouse that moved each day closer to Christmas (see below). My two younger sisters and I used to take turns (and truely argue) moving the mouse each day. 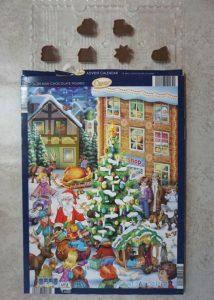 Some years we would each also get our own chocolate advent calendar (usually from the Dollar Tree). I loved opening the cardboard flap each day and getting my very own delicious piece of chocolate to help me count down to Christmas. 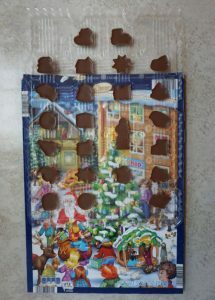 I still enjoy using an advent calendar as an adult and this is how the idea for a chocolate Keto Advent Calendar was born. 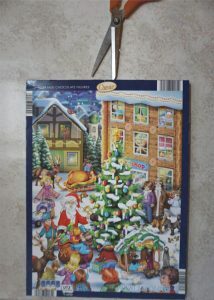 I knew there was a way to recreate a sugar free, low carb and Keto friendly adevent calendar. 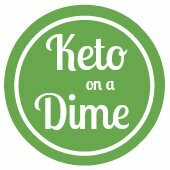 What is a low carb or Keto Advent Calendar? The advent calendar originated in the 19th century where religious families made a chalk mark every day of December until Christmas Eve (see more here). 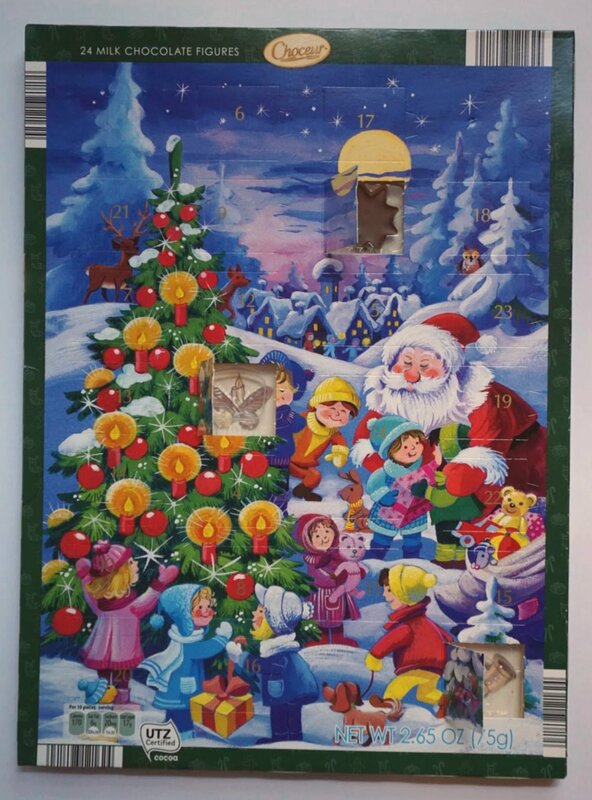 Today, an advent calendar typically has small numbered flaps which when opened on each day of Advent (December 1-24th) reveal a picture, treat or prize celebrating the Christmas season. 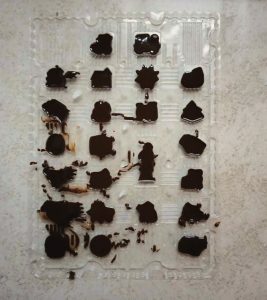 A low carb/Keto Advent calendar allows you (and me) to celebrate the Christmas season with chocolate without all of the extra carbs and sugar. 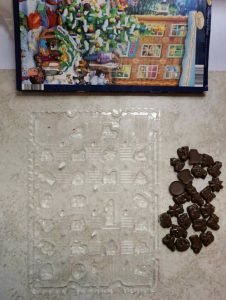 The cool thing about this Keto Advent Calendar, is that it uses the store bought calendar base and the mold inside, but we replace the sugary chocolate inside with low carb sugar free chocolate instead. This is a super easy project and should be budget friendly. So, if you aren’t a Pinterest perfect crafter (I know I am not), this is a project for you! A boxed advent calendar. I bought mine at Aldi for $1.19. You can also check the dollar store for these. If for some reason you can’t find these in store, you can order them online for about $5-7 (see ideas here). And remember, we are replacing the chocolate inside so you don’t need to worry about the macros. 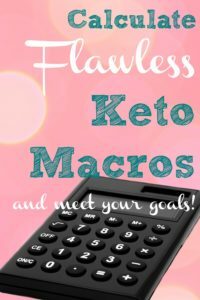 How do I make this Keto Advent Calendar? There are going to be quite a few steps, but it is not complicated! 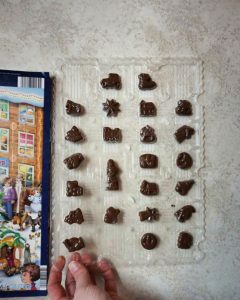 The basic idea is to take a pre-made advent calendar, dump out the sugar filled chocolates and then refill the plastic mold with Keto friendly chocolate. Once the Keto friendly sugar free chocolate has hardened, you will replace the plastic insert into the cardboard mold and you’re done. Simple. Don’t be intimidated by the steps. Give it a try-you’ll love it! 2. Slid out the plastic insert that holds the sugar filled chocolates. Sometimes the plastic insert is held to the cardboard with glue or adhesive, so go slow and separate the plastic from the cardboard and slide the cardboard out. 3. 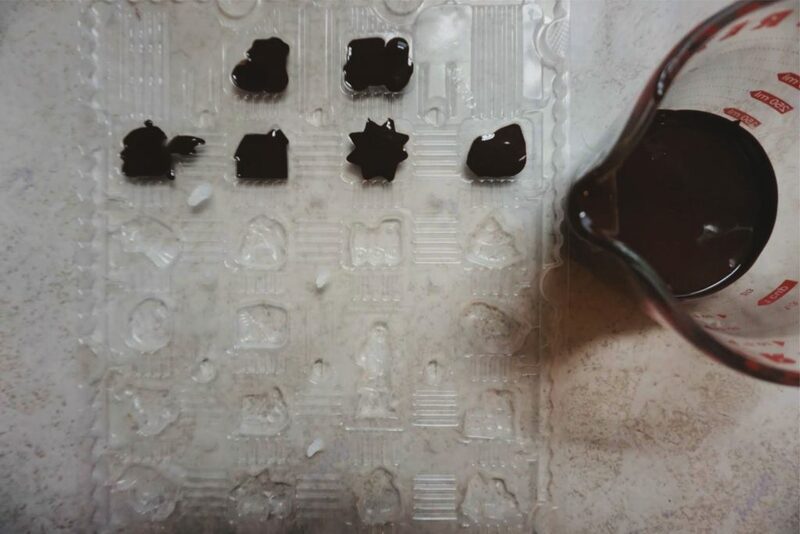 Pop out each piece of chocolate until the plastic mold is empty. I suggest you throw out these chocolates so you aren’t tempted….that’s what I did to be safe. Or pass these on to someone you know can enjoy them. 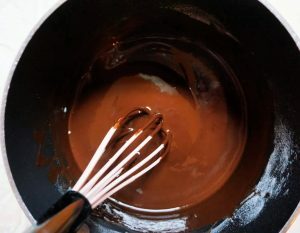 The easiest way is to melt 3 oz of Lily’s chocolate chips either in the microwave, on the stove top or over a double boiler-just make sure you don’t burn the chocolate! If you don’t have Lily’s chocolate chips, melt down 3oz baker’s chocolate, 1 TBSP coconut oil or cacao butter. After melted add drops of stevia to taste. I used about 20 drops and the chocolate was very dark, rich and yummy, but add more ti fit your taste! 5. Pour the melted chocolate into the plastic mold. I found using a measuring cup with a spout makes this step easier. You can also use a candy dropper if you have one. Then let this cool at room temperature. Don’t refrigerate or freeze this. If you live somewhere exceedingly warm, and the chocolate won’t set, put it in the refrigerator, but just know that the chocolate will lose some of it’s shine. Try to wipe up as much of the chocolate as you can. But if not, don’t worry, this is going to be covered by the outer cardboard box shell of the calendar itself, so you won’t even notice it. 6. After the chocolate has cooled and is completely set (the time will depend on the temperature of the room, but usually a few hours), slide the plastic mold back into the cardboard calendar shell. You may have to tape the top of the box where you had cut it open to ensure a tight seal. Keep the Keto Advent Calendar horizontal if possible. 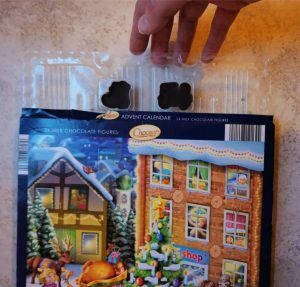 This will prevent the chocolates from slipping out of the mold if the reseal on the box isn’t tight enough. 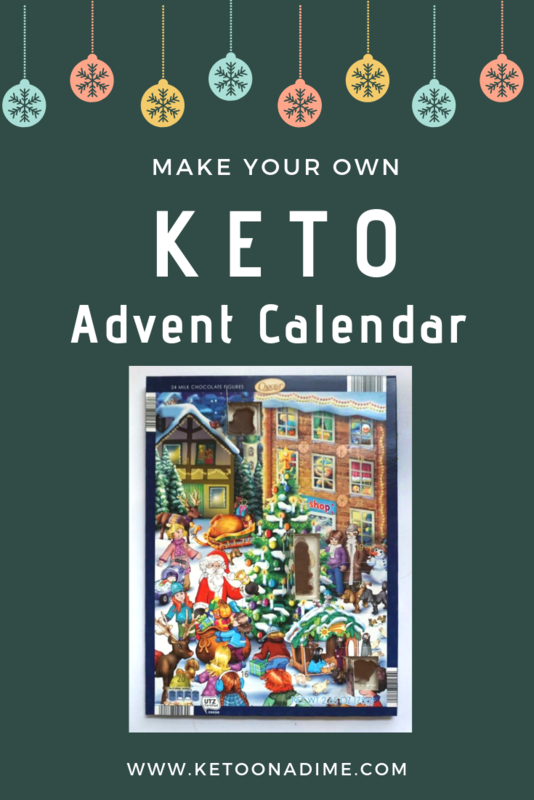 Comment below with a photo of your Keto Advent Calendar!